More and more connected objects are launched every day and many of them invite themselves in our homes to make our lives easier. Some measure, others inform, but mostly all of them allow us control from afar in order to enhance our comfort, save energy and protect our homes. There are many options for the smart home, but we think you should pick Sinopé. We don’t compromise on quality. Materials are selected with care to obtain an aesthetic and durable product. Each unit is tested at our installations by our engineering and production teams to make sure it all works to perfection in your home. Our devices are affordable simply because it’s our mission. Our goal is to ease the access to smart devices so that more consumers can benefit from the smart home advantages by increasing their comfort, protecting their belongings and enhancing control over their energy use. Sinopé Technologies’ products give you the full control based on your needs at any time, from anywhere. You can set alerts, program precise schedules, block the manual control of your devices, change the LED’s color on some others and so much more! Find out about our products features. Sinopé Technologies is the company offering thermostats that are compatible with the greatest variety of heaters. Period. Whether you have baseboard heaters, convectors, fan-forced convectors, floor heating, double-pole or low voltage heating systems, we have what you need. Why go elsewhere when the solution you are looking for is right here? *Not sure what heating system you have at home? Let us help you. Whether you are a novice or a tech enthusiast, we have the solution that you need. Sinopé has a turnkey solution with its Web programmable devices, but you can also add our smart devices to your home ecosystem with our Zigbee and Wi-Fi product lines. Neviweb is the management platform for the Web programmable product line. 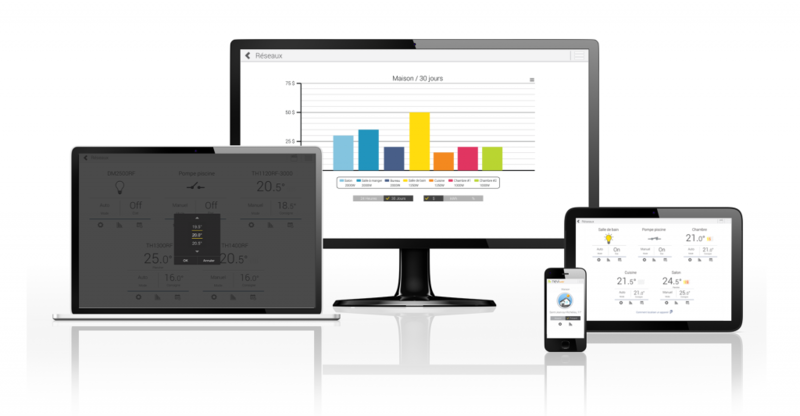 Intuitive, bilingual and easy to use, neviweb gives you access to a vast number of functionalities and allows you to control your compatible devices from any smartphone, tablet or computer. At Sinopé, we are specialized in creating energy management control systems and in designing management platforms. Our devices and platforms make the perfect match to give you precise and proper control based on your needs. Our company was founded in 2010 and since then, we created over 50 different devices made for other companies in North America or sold under the Sinopé brand. We really can’t stay still: many products are to be launched soon and many others are in the works. We’re also working on growing our compatibility with home automation platforms like SmartThings and Control4 and with voice assistants such as Alexa and Google Assistant. Yes, that’s true: our devices are designed in Canada. Sinopé Technologies’ office is located in Saint-Jean-sur-Richelieu, in the province of Quebec. When you buy the Sinopé brand, you encourage the Canadian economy…and you choose devices that are thought for the North American lifestyle. That’s what our clients say about us. Our customer service team is there to answer you with diligence, whether you’re thinking of starting your smart home with Sinopé devices or if it is for after-sales service. You have any questions? Here is how to reach us. In short, the Sinopé smart home increases your comfort, protects your belongings and helps you reduce significantly your electricity bill with ease. Finally! An affordable solution that gives you full control.